The screens of this porch don't go all the way to the ground, so furniture can be backed against the walls. 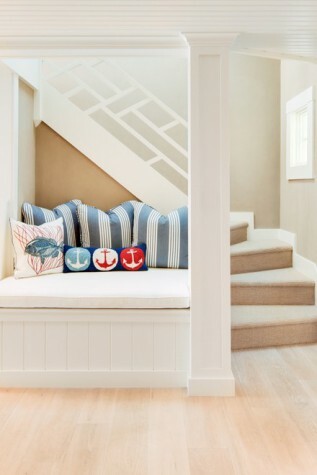 Louise Hurlbutt used all-weather rattan and blue pillows with white piping for a nautical look. 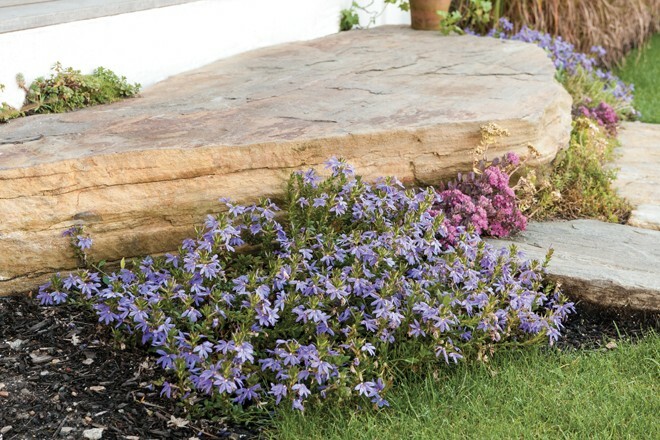 The heavy-duty rug from Sweden via Hurlbutt Designs is made of recycled materials. It can be taken outside and hosed down. The cathedral ceiling in the bathroom has a chandelier made out of wine barrels, a pine plank floor, and Carrera marble countertops. 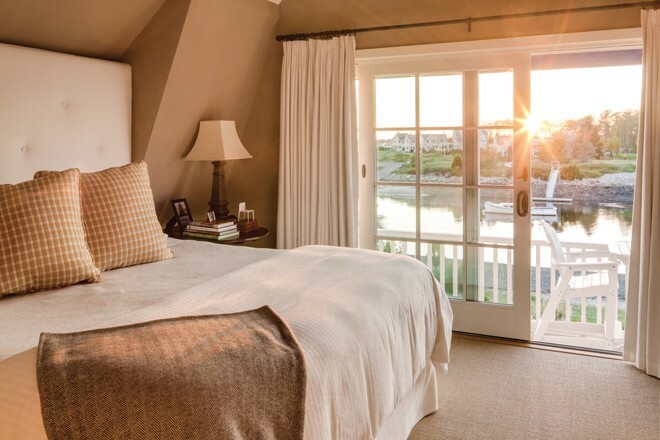 The master bedroom features sliding doors that open to the second-floor deck, which has views of the mouth of the Kennebunk River and the coastline, all the way down to New Hampshire. The custom buttoned headboard was made to fit the angles of the sloped roofline. The walls are Ralph Lauren suede paint. 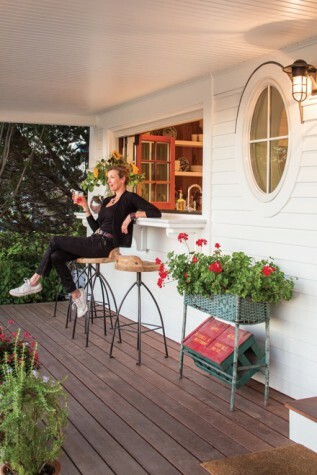 The kitchen's bifold window opens onto the porch's bar. The stools are the same stools used at the restaurant Earth at Hidden Pond. 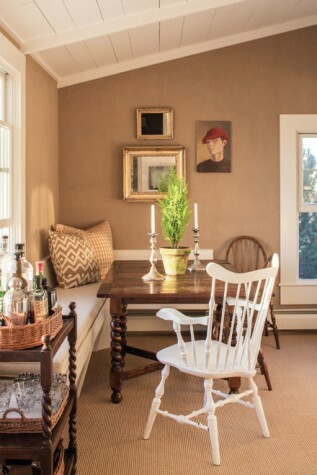 A corner of the upstairs suite with a built-in banquette around the dining table and randomly spaced painted planks for the sloped ceiling. The pairing of an old portrait and a mirror is something Tim Harrington has employed at the inns that he and his business partners own. 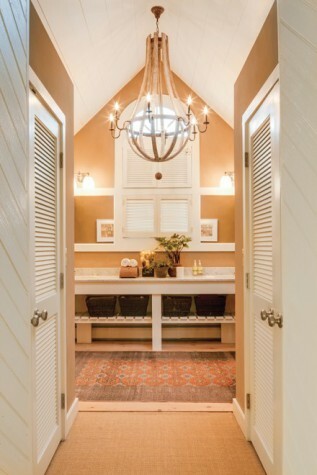 A wall-to-wall sisal rug covers the floor. 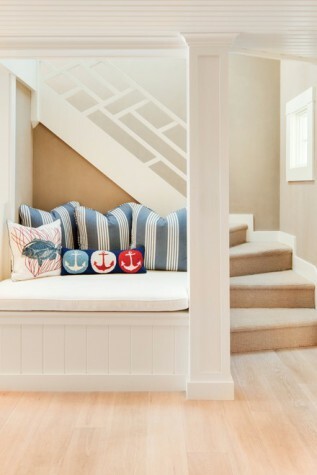 A nautically inspired bunkroom for children, with built-in beds of pine, drawers with rope pulls, and striped duvets. 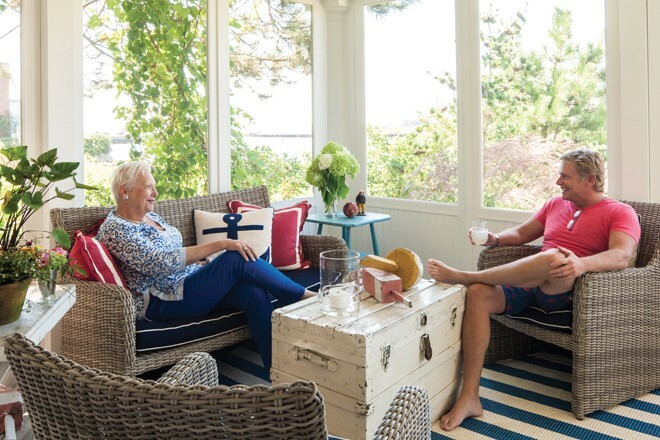 Louise Hurlbutt found this backgammon table for the Tides Beach Club, one of the hotel properties that Tim Harrington and his business partners own. Having enjoyed watching guests at the table, Harrington decided he wanted the same table for his house. 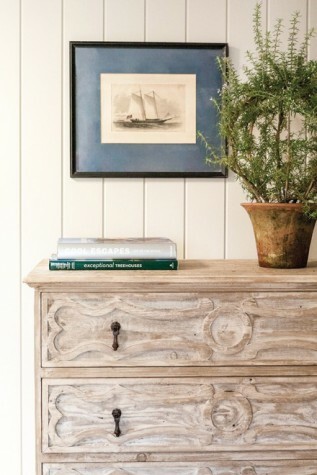 The paintings are flea market finds. 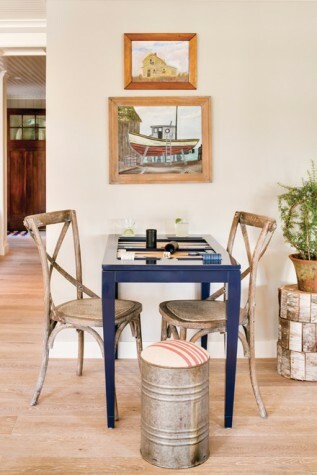 The metal stool is from Hurlbutt Designs. 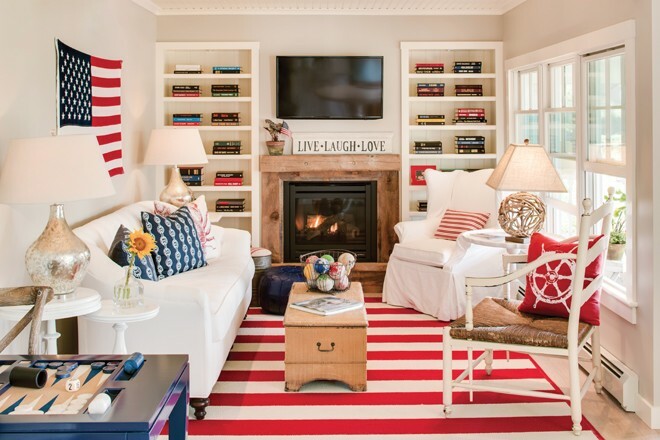 The living room design began with the red and white striped rug and grew to include the flag, which had belonged to Tim Harrington's father, the white sofa and easy chair, and other accessories. Books are stacked neatly on the shelves on the far wall and arranged in the many orderly bookcases throughout the house. 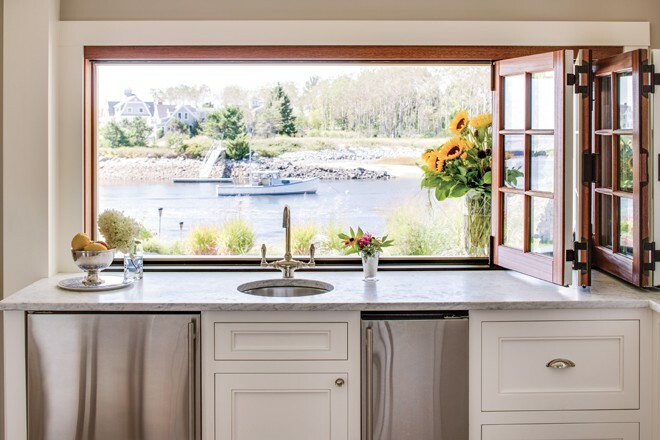 A mahogany bifold window positioned over a farmer's sink offers water views. 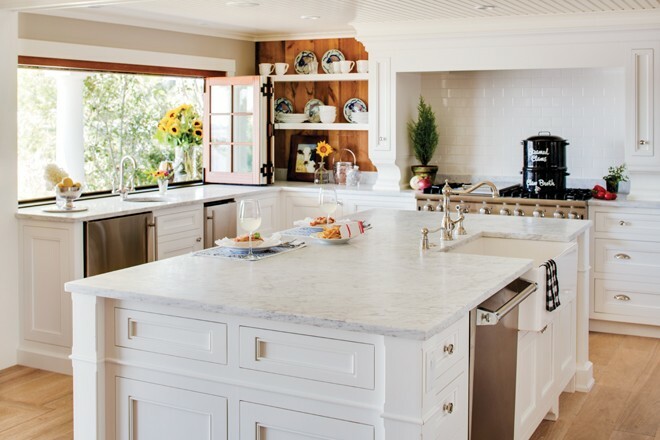 The countertop is Carrera marble. 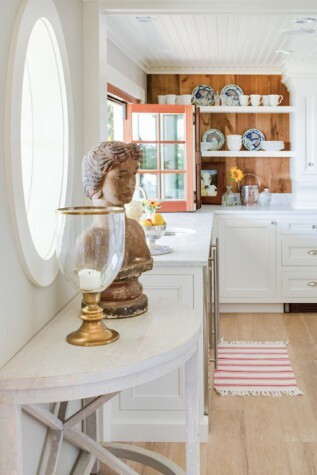 With only two interior walls, the kitchen doesn't have much room for upper cabinetry. To create additional storage, Adam Bialas of Bialas Custom Interiors of Holyoke, Massachusetts, built an oversized kitchen island. 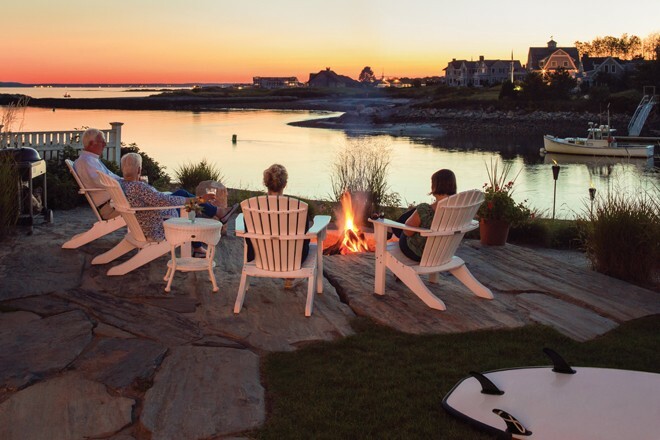 A fire pit of roughback stone surrounded by ornamental grasses designed by Ted Carter.